The classic Mimosa drink recipe is an old standard cocktail. You may generally think of it as orange juice and champagne, but there’s actually a little bit more to it than that. 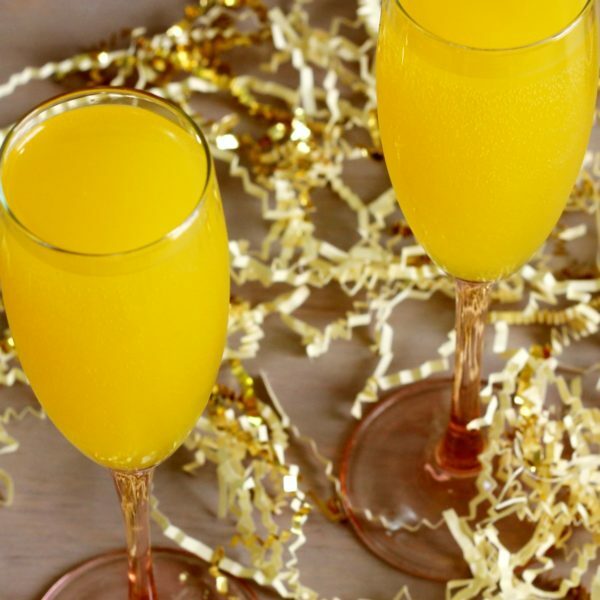 The usual Mimosa recipe blends champagne with orange juice and a touch of triple sec. But you can use any orange liqueur you like. And I think your choice depends on what kind of champagne and orange juice you have. For example, Grand Marnier is a little sweeter than Cointreau and or triple sec. If your champagne is on the sweet side, you might choose Cointreau to balance it. If it’s more on the dry side, you might prefer Grand Marnier to add a little sweetness. And if you are fresh squeezing your orange juice, you might check to see how acidic your oranges are before deciding. This drink is most often served as a brunch cocktail. And it works so well in that capacity because it’s low on alcohol and high on vitamin C.
It doesn’t require an expensive champagne, although I would plan to spend $15 or more on the bottle, just to make sure it’s nice and drinkable. Most recipes call for a Brut champagne, which is the driest type available. 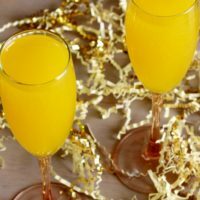 I generally use prosecco for champagne cocktails, and it’s a good choice for the Mimosa. You can even use a sparkling wine. You may find your “ideal” mimosa requires a particular brand or type, but you can’t go wrong with any decent champagne. But the Mimosa isn’t just a brunch drink. It’s also good anytime you’re wanting a drink that’s light on alcohol, but delicious and easy to love. It makes for a nice aperitif, too. You can serve these before a dinner party starts because they’re light enough on the alcohol not to get anyone tipsy on an empty stomach. And if you’re entertaining non-drinkers, of course, we have a delicious Mockmosa just for them. It blends orange juice with dry sparkling white grape juice. If you love the Mimosa, check out the Melon Mimosa (Midori and champagne), the Champagne Fizz (gin, lemon, and champagne) and the San Remo (champagne, grapefruit juice, and liqueurs). You may also want to take a look at my collection of champagne cocktails. The Mimosa is a classic brunch cocktail, but it's also wonderful for celebrations and parties. Most people know it includes orange juice and champagne, but it also has a little bit of orange liqueur which adds to the flavor. Pour the triple sec into a champagne flute. Pour in the orange juice slowly, letting it stir the triple sec. Pour in the champagne slowly, letting it stir the orange juice and triple sec mixture. Optionally, garnish with an orange slice. Really easy mix ! Great for the holidays coming up. One can also add blackberry liquor if needed. I’m serving this for my sister’s bridal shower.